Lindsey the full time RVing Corgi here! I wanted to update you all on what has gone on the past few months. The last time that I wrote I was on my way to Florida because Mom and Dad had some work there and they also wanted to visit friends and family while in the area. Dad packed up Frank, our class C RV, and we headed out of Texas to go some eleven hundred miles to the Tampa, FL area. It was great to get away from Texas and the one hundred degree temperatures. Florida is hot too, but it was in the low nineties, high humidity, but always an afternoon shower. Mom, Dad, and I boondocked a few nights on the way to Florida, but it was so hot that they decided to stay overnight in an RV park because they did not feel it was safe to run the generator all night while sleeping. I was glad they did! After three days of travel, we wound up in the Tampa area and stayed at Lazydays RV Resort. Mom and Dad like going there because they can check out all the RV’s and see what is new in the industry. I recognized the place as I have been there so many times before. When we first got there Dad got out my wagon and he put me in it. Before I knew it I was being pulled around the dealership, and I was allowed inside too. I suddenly got the idea that perhaps they were not only looking at RV’s to just look but perhaps they were thinking of getting another one. How I knew was we appeared to be in the sales area where everyone was welcoming us to Lazydays and offering assistance. I loved all the attention! I looked so cute in my wagon! After that, we went over to the campground and parked the RV. I was still not sure what Mom and Dad were up to, but by conversations I could understand, it did sound like a newer RV was in my future. I like Frank but I sure would like a little more room to stretch out and play. Plus, a few more hiding spots would be nice! Over the next few days, Mom and Dad were sure gone a lot. While they were away I got caught up on my naps. Travel days really wear me out. It’s hard to get a really good nap when the RV is rolling down the road, especially with some of the roads in Louisiana and Mississippi! We were there at Lazydays for about a week and then, all of the sudden, we were leaving. 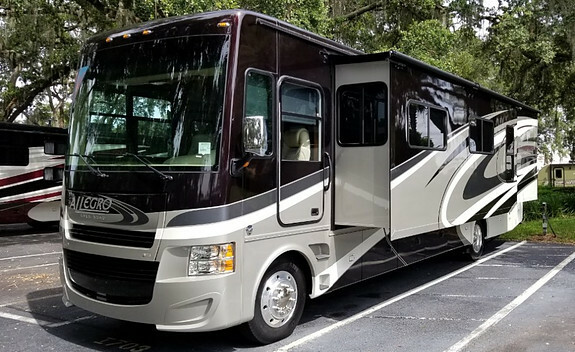 So I figured that maybe we were not getting another full time RV home. It looked like we were heading further south. A short while later we were in Fort Myers, FL. Mom and Dad told me they were there to visit Dad’s Mom and their God dog Rylee. Since they left the HMRVI truck back in Texas, Mom and Dad rented a small car to be able to go visit friends a family. I got to go along several times when we went to visit Rylee and her Mom and Dad. Rylee came to stay with us three years ago when she was just a puppy. She got a little fresh with me back then so I bit her ear. I think she still remembers that! For this visit, Mom and Dad thought it was best if we stay separated so as not to get into trouble. I was also trying to stay away from the two-year-old boy. I am an old girl and not able to play that way anymore. Then, while Mom and Dad visited his Mom, I stayed home and got to catch up on more sleep. It was a long day because they had to go down to Naples, FL. After eight nights down in the Fort Myers/Naples area, over the July 4th weekend, we were on the road again. I did not know where we were going, but after a stop at Publix for groceries, we were headed back north. I have a good sense of direction! A few hours later we were back at Lazydays again. Now I was really confused. There was not that much talk about what was going on, or at least that I could hear or understand. My hearing has really gone downhill these days. Oh, and I had my fourteenth birthday on July 9th! At ninety-eight years old I guess I am doing pretty good! I may not be able to hear and get around as well as I used to but I am doing pretty good for a Corgi of my age. Anyway, Dad parked the RV in the campground and then they disappeared again. At this point, I knew something was up. Then, the next day I noticed things were starting to get packed up. The pictures were coming off the walls and stuff was being put into bags and boxes. Then, the RV was on the move again. Dad went a short distance from the campground and parked it in a lot with a bunch of other RV’s. All of a sudden this big beautiful newer looking RV was parked next to Frank. Mom and Dad seemed to know what was going on. They disappeared into the other RV, and, all of the sudden, I was whisked away out of Frank and into the other RV! Wow, it is beautiful! I was checking it out and Mom decided my crate was the best place for me to stay out of the way. All the stuff from Frank was now being brought into the new RV. It took a few hours and it looked like a bomb hit, but all our stuff was now in the new RV. I heard Dad refer to it as Miss Tiffy. Later on, after stuff started to be put away, I was able to check out my new digs. It is really nice, and it has so much more room than Frank! The one thing that I did notice right away is that the flooring is really slick! For me, it’s like walking on ice. Dad put down some carpets for me so I have a place to get some traction. Dad keeps laughing at me but I am not amused! We spent the night in Miss Tiffy, at the dealership, and then by late morning, we were on the road heading back to Texas. Dad had to get back for business. Miss Tiffy rides so much better than Frank due to the larger tires and suspension system. I was able to roam about a little but I mostly stayed in my crate as it is much safer that way during travel. While I was continuing to investigate the RV over the next few days I discovered the most wonderful thing for a full time RVing Corgi: a doggy peep window. It’s right at my level and lets me look out anytime I want. I can even lay there and enjoy the view, whether we are moving or not. It is located by the front curbside corner of the RV. I also love my new couch! It is a great place to sit with Mom and watch Lassie. Another really cool thing is that I can use Dad’s office area when I want to write my website posts. It’s really comfy and I have plenty of room to work. Mom has to help me up on the chair but once there I can really get things done. I think better with my hat on! It has been four weeks that we have now been living in Miss Tiffy and I must say that I approve! Mom and Dad did a good job picking out my new RV home. From what I heard they worked really hard to check her out to be sure she was what they were looking for and that she would be trouble-free. You can read their side of the story here. Time for another nap! Thanks for stopping by. I’ll check in again soon. Love these stories about Lindsey! We have 2 corgis, Baxter 8 and Turbo 12 and we are on a trip (in a class C) partway back from the north and east to see the colors even though we are actually going through colors at home in Colorado now. I was searching for ideas about the ‘hair’ in an rv and ran across these. Fun, fun. We used to have a 3rd corgi that was a ginger as Lindsey. We left them at home with someone else caring for them while we went to a grandson’s graduation in Atlanta. The day after we got home, Ginger passed. Hubby said we would never leave them home again thus the RV. We tried a Sprinter for 2 years and then had to upgrade. Keep up the great stories. I read them to hubby as we travel. Sorry to hear about your Corgi. It is so hard to lose a fur-kid! Thanks for stopping by and sharing. We hope Baxter and Turbo are filling in the gap. We’ll tell Lindsey to get off her stub and write another post. LOL!